Despite being widely recognized as John Wesley’s key moment of Christian conversion, Aldersgate has continued to mystify regarding its exact meaning and significance to Wesley personally. This book brings clarity to the impact this event had on Wesley over the course of his lifetime by closely examining all of Wesley’s writings pertaining to Aldersgate and framing them within the wider context of contemporary conversion narratives. The central aim of this study is to establish Wesley’s interpretation of his Aldersgate experience as it developed from its initial impressions on the night of 24 May 1738 to its mature articulation in the 1770s. By paying close attention to the language of his diaries, letters, journals, sermons, tracts and other writings, fresh insights into Wesley‘s own perspective are revealed. When these insights are brought into wider context of other conversion narratives in the Christian milieu in which Wesley worked and wrote, this book demonstrates that this single event contributed in significant ways to the ethos of the Methodist movement, and many other denominations, even up to the present day. This is a unique study of the conversion of one of history’s most influential Christian figures, and the impact that such narratives still have on us today. As such, it will be of great use to scholars of Methodism, theology, religious history and religious studies more generally. 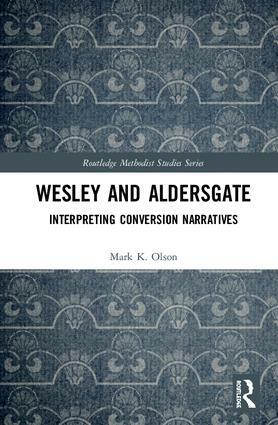 "Wesley and Aldersgate is a useful book for Methodist Studies scholars, as well as to Religion scholars and laypeople interested in conversion—for the latter—with the aid of some of the historical and theological works upon which Olson draws to fill in context." Mark K. Olson is Adjunct Faculty at Indiana Wesleyan University and Nazarene Bible College, both in the USA. He has published several books on Wesley including A John Wesley Reader on Eschatology (2011) and John Wesley’s Theology of Christian Perfection (2007) and multiple articles. Methodism remains one of the largest denominations in the USA and is growing in South America, Africa and Asia (especially in Korea and China). This series spans Methodist history and theology, exploring its success as a movement historically and in its global expansion. Books in the series will look particularly at features within Methodism which attract wide interest, including: the unique position of the Wesleys; the prominent role of women and minorities in Methodism; the interaction between Methodism and politics; the ‘Methodist conscience’ and its motivation for temperance and pacifist movements; the wide range of Pentecostal, holiness and evangelical movements; and the interaction of Methodism with different cultures.